Knob Creek Rye Whiskey (50.0%): The moment you cross the New Hampshire state borders state-run liquor shops pop up on both sides of the highway offering some sales tax free shopping fun... On our road trip to Maine a couple of weeks ago we also decided to take advantage of it and took the first right exit to one of those shops... After a quick walk through (It was 9AM in the morning after all...) we ended up with a bottle of Knob Creek Rye and at the end of the trip I managed to save a sample to bring back for today's post. 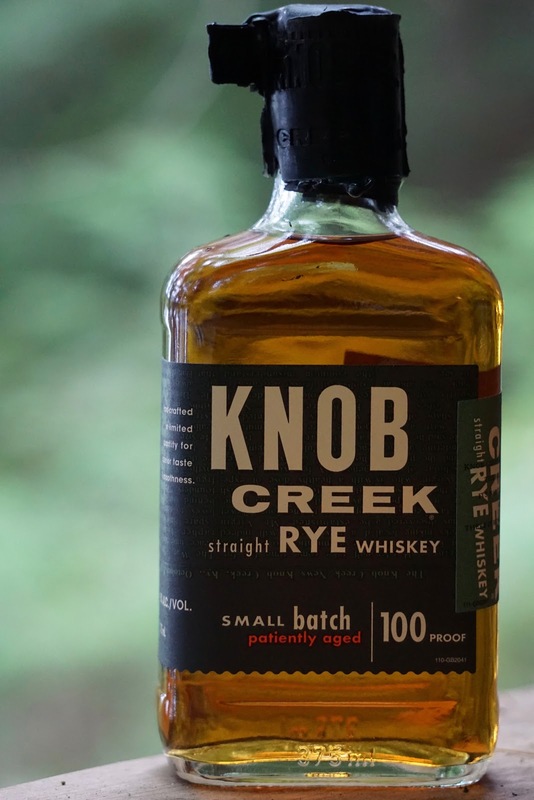 Although Knob Creek Rye is relatively new in Beam Suntory's portfolio the company actually bottles rye whiskeys regularly under their Jim Beam, Old Overholt and (ri)1 labels for quite a long time. I believe the mashbill is the same for all these different brands but the casks used for each one are selected from specific warehouse locations. This one is a non age statement expression bottled at 50% abv. Color: Dark copper, orange blossom honey. Thin and fast moving legs around the glass. Nose: First thing that jumps out of the glass is alcohol burn... Letting it to sit for a while helps. Toasted German rye bread and a chunk of butter melting on it. Honey butter, cardamom and cumin seeds. Spearmint, lightly toasted oak and golden raisins. A few drops of water dials back the rye notes... I am getting more honey and corn whiskey aromas now. Yes, actually it noses like a corn whiskey now. Palate: Young... It is spicy and buzzing on the tongue. Again rye is very dominant. Rye bread and toasted cumin seeds. Sesame seed candy and black cumin seeds (love in a mist). Savory... Still quite hot and spicy but it's balanced... Water pulls its spiciness down but again adds corn driven notes: Corn on the cob, popcorns and Aunt Jemima syrup. Although adding water made it very easy to drink I have to say that I still prefer the rye spiciness before I added water. Finish: Long with sesame seeds, cumin seeds and honey.